Two quarterbacks involved in a highly celebrated trade during the previous offseason met up with their new teams for the first time as the Washington Redskins hosted the Philadelphia Eagles on October 11, 1964. Coached by Bill McPeak, the Redskins, who had not compiled a winning record since 1955 and were 3-11 in ’63, had obtained QB Sonny Jurgensen (pictured at right) from the Eagles for QB Norm Snead. Jurgensen was 30 and an accomplished long passer, although injuries had hindered him the previous two years. There was an outstanding deep receiver available in flanker Bobby Mitchell and rookie HB Charley Taylor provided an able runner from scrimmage as well as receiver out of the backfield. Thus far, Washington had not profited, having gotten off to an 0-4 start. The Eagles had gone from NFL Champions in 1960 to a last-place club in 1962 and ’63 and were in their first year under new Head Coach/GM Joe Kuharich, who had been quick to revamp the roster with multiple trades upon his arrival. Norm Snead was five years younger than Jurgensen and had endured a tough tenure in Washington after taking over the starting job immediately as a rookie in 1961. Other key players on Philadelphia’s offense included TE Pete Retzlaff and HB Timmy Brown, an all-purpose back who twice set NFL records for total yards the previous two seasons. The Eagles were 2-2 coming into the game at Washington. There were 49,219 fans in attendance at D.C. Stadium. The Redskins got the first break when, following a three-and-out possession, FB Israel “Izzy” Lang fumbled the resulting punt and Washington got the ball back at the Philadelphia 46. On the next play, Sonny Jurgensen threw to flanker Bobby Mitchell for a 29-yard gain. Two carries by Charley Taylor picked up another 15 yards, but the drive stalled at the four and the home team came up empty when Jim Martin’s 11-yard try for a field goal hit the goal post. A short series by the Eagles ended with a punt and this time Washington didn’t fail to score, advancing 68 yards in seven plays. Jurgensen passed to Mitchell for a 29-yard touchdown and Martin added the extra point. The home team regained possession shortly thereafter when Timmy Brown fumbled and SS Jim Steffen recovered at the Philadelphia 22. Two plays later, Jurgensen threw to FB J.W. Lockett for a 22-yard TD, Martin converted, and the Redskins were up by 14-0. That remained the score throughout the second quarter as the Eagles were unable to move effectively on offense and two Jurgensen passes were intercepted. With time running out in the first half, Jurgensen connected with Mitchell (pictured at left) once again for a gain of 56 yards to the Philadelphia nine and followed up with another toss to the star flanker for a touchdown. Martin’s PAT gave the Redskins a 21-0 halftime lead. The Eagles got a 43-yard kickoff return by HB Ollie Matson to start the third quarter and advanced 59 yards in three plays. Norm Snead threw to Pete Retzlaff for 11 yards and, after the Redskins were penalized 15 yards, Brown carried twice, for six yards and then a 27-yard TD. Sam Baker converted to make it a 21-7 tally. A short Washington series ended with a punt, rookie FS Paul Krause intercepted a Snead pass, and the Redskins were forced to punt again. Starting from midfield, the Eagles got another big play from Brown, who carried for a gain of 36 yards. Three plays later, it was Brown catching a toss from Snead for a 14-yard touchdown. Baker’s extra point attempt was unsuccessful, but the visitors were now just eight points behind at 21-13. 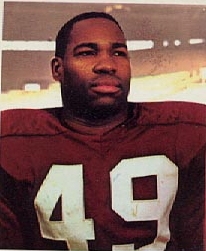 The Eagles attempted an onside kick that LB Jimmy Carr, who had gone from Philadelphia to Washington as part of the Jurgensen for Snead trade, recovered for the Redskins at their 38. LB Maxie Baughan sacked Jurgensen for a loss of four yards, but Jurgensen then threw a short pass to Taylor who grabbed it at the line of scrimmage and made his way downfield in spectacular fashion for a 66-yard TD. Martin added the point after and Washington was up by 28-13. Philadelphia responded with a ten-play drive that resulted in another Brown touchdown, this time on a five-yard run. Baker was successful on the extra point and the third quarter ended with the Redskins ahead by 28-20. Washington had the ball as the final period commenced and drove 67 yards in seven plays for what proved to be the game-clinching score. Jurgensen completed four straight passes, the longest to Lockett for 18 yards, and after misfiring connected with Taylor for a 24-yard TD. Martin’s point after gave the Redskins a comfortable 15-point lead. The Eagles managed to threaten only once more, when a drive to the Washington 24 ended with an incomplete pass on a fourth-and-12 play and the Redskins won by a final score of 35-20. Washington easily led in total yards (434 to 221), especially in terms of net passing yards (361 to 95), and also had the edge in first downs (17 to 16). Both teams recorded three quarterback sacks apiece while the Eagles turned the ball over three times, to two by the Redskins. Washington was penalized 10 times, at a cost of 96 yards, to two flags for 20 yards thrown on Philadelphia. 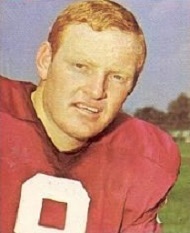 Sonny Jurgensen was impressive against his former team as he completed 22 of 33 passes for 385 yards and five touchdowns while being intercepted twice. 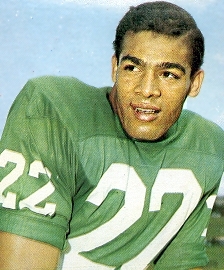 Bobby Mitchell was the chief recipient of those throws with 12 catches for 183 yards and two TDs. Charley Taylor rushed for 61 yards on 22 attempts and gained 92 yards on three pass receptions, two of which went for touchdowns. For the Eagles, Norm Snead was far less successful than Jurgensen in his return to Washington, connecting on only 12 of 35 throws for 126 yards and a TD while giving up one interception. Timmy Brown (pictured at right) ran for 101 yards on 14 rushing attempts, two of which scored touchdowns, and scored a third TD on one of his two catches for 12 yards. Pete Retzlaff caught 5 passes for 38 yards. The win against Philadelphia marked something of a turnaround for the Redskins. While they lost to the Cardinals the next week, they then won five of their next six games, including the rematch with the Eagles, on the way to a 6-8 record. That tied them for third place in the Eastern Conference with Philadelphia, which won its next two contests but then faded during the season’s second half. Sonny Jurgensen ranked second in the NFL with 207 pass completions, 2934 yards, and 24 TD passes. He was chosen to the Pro Bowl. So were Bobby Mitchell, who had 60 catches for 904 yards (15.1 avg.) and 10 TDs (tying for the league lead with Johnny Morris of the Bears and LA’s Bucky Pope) and Charley Taylor, who placed third with 1589 all-purpose yards and received Rookie of the Year recognition as well. Timmy Brown missed four games due to injury but still scored 10 touchdowns as he rushed for 356 yards and five TDs and caught 15 passes for 244 yards and another five scores. Adding in kick returns, he gained 1388 all-purpose yards. Norm Snead had a typically uneven year, completing 48.8 percent of his passes for 1906 yards and 14 touchdowns while giving up 12 interceptions, and two of the team’s wins came with other quarterbacks behind center. He and Jurgensen would always be linked by the trade between the Eagles and Redskins and this first post-deal matchup between the two yielded a typical result. Washington went 9-2-2 in games between the teams in which Jurgensen and Snead went head-to-head.